Dreadlock beads add more personality to the hairstyle. 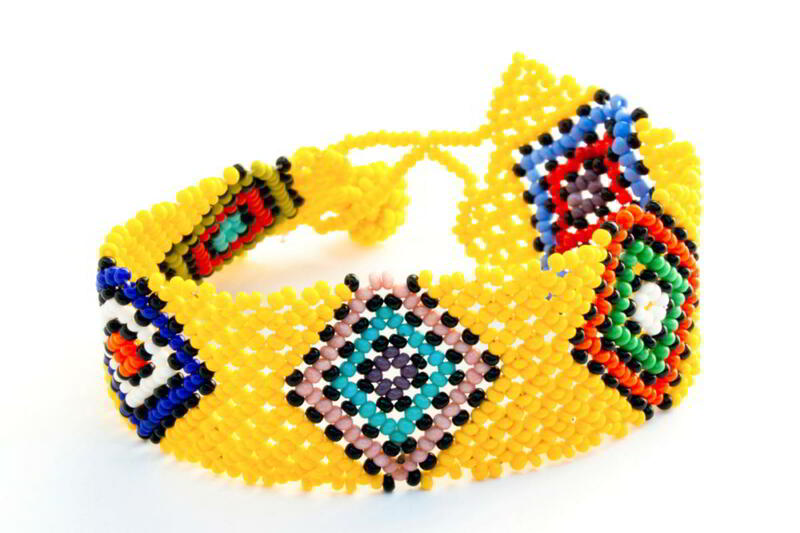 You do not always have to go hunting for these beads and instead you can make them yourself. Learn to make dreadlock beads by taking inspiration from the 8 bead making methods mentioned in this post. You can beautify your dreadlocks using beads. In case commercially available beads seem a bit too expensive or unnecessary, you may always make your beads on your own! You can add your personal touch and make beads which are to your liking. Some people prefer simpler beads, which ironically are usually never available in stores and the ones you can find are too ostentatious. This article suggests some ideas for making dreadlock beads at home, using simple materials. You can make dreadlock beads using polymer clay. This clay is sold in most art and craft stores. This polymer clay needs to be cooked at 300º Fahrenheit, which is easily possible using the kitchen oven. Use a pen or stick with a diameter, which according to you is equivalent to the radius of your individual dreadlocks. It is always better to let the beads be slightly bigger, so that they can accommodate the hair and not feel too tight. Now use a very flexible wire (aluminum wire or florist wire), and wind it loosely around the pen. The pen must be loose enough to rotate under the wire. Let there be a slight distance between each coil of wire. If you wish to add decorative danglers to the bead then, you will need to leave a loop at the tip of the wire. Now wrap the polymer clay on the wire, and while you cover the wire, try to keep rotating the pen gradually. This rotating movement will prevent the clay from sticking to the pen. Gradually detach the wire from the pen and place this bead in the oven. Set the temperature at 149º Celsius or 300º Fahrenheit for 10 minutes. As a suggestion, you could use colored clay, so that you do not have to apply the base paint for each bead. Therefore, if you wish to have a black bead, use black polymer clay. Once the bead has been baked, let it cool down and do not touch it for the next few hours, after which you can use polymer clay paint, and decorate the bead as you prefer. Look for attractive glass pebbles which can be drilled, to form dreadlock beads. This DIY project will require a handheld glass drill machine. 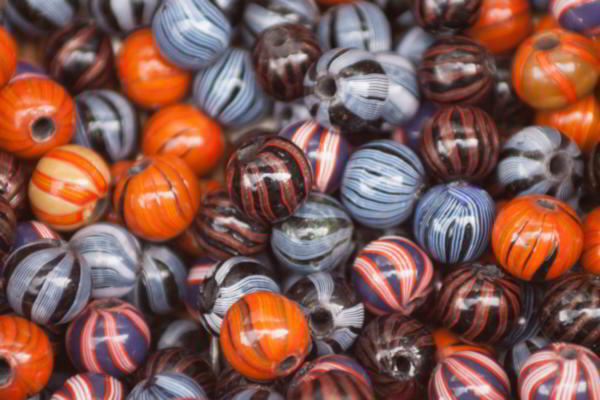 Once you have made the glass bead as per the diameter of your dreadlock, you can decorate the bead with tiny glass or clay beads. The easiest way to do this, is to take a strong nylon string and fill it with tiny beads, after which you may wind the string through the glass bead. Another easy way to decorate your glass bead, is to wrap a beaded sleeve over a thick glass bead, and then stitching the borders of the sleeve to the inner surface of the bead. 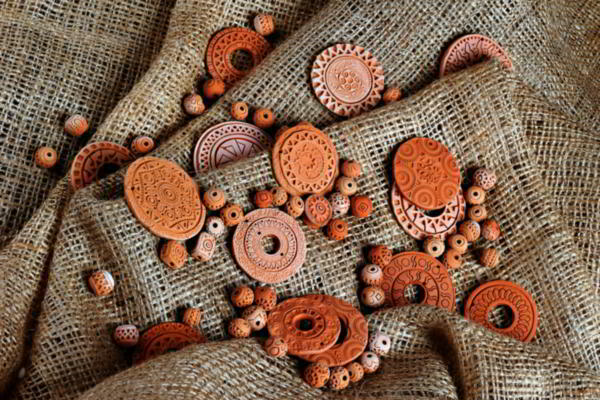 You may follow the same process using clay / polymer dreadlock beads. This is an extremely time-consuming and intricate way of making dreadlock sleeves, using tiny beads of various colors, shapes, and patterns. The idea is to form a network of threads holding a string of beads, so that they form a small bracelet, which is long enough to wrap around a section of a dreadlock. You will need to start with simple designs, perfect your skills before you are ready for more complicated sleeve patterns. You may even try making these sleeves, by stitching the beads on a piece of fabric, which you can wrap around a dreadlock section. You may also try creating fabric sleeves, which have tribal, batik, or hand-painted prints on them! There are a myriad of chunky rings available which can be substituted for dreadlock beads or sleeves. You can also try making a sleeve, using wire and fixing / sticking a decorative stone on the wire. You can also try buying a few ring skeletons, which you can experiment with using hand-painted polymer / ceramic tablets, or colored glass beads, pebbles, shells, etc. 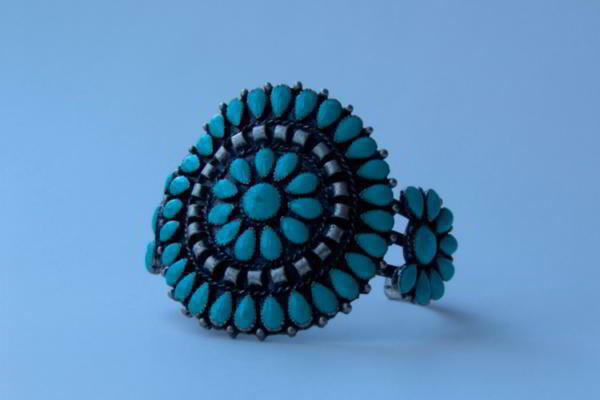 Look for rings which have an antique, or bizarre appeal, and are vibrant. Ring designs which include the peace sign, yin-yang, religious symbols, or Rastafarian colors, can be found in wide varieties. If you have some experience with wielding and jewelry-making, you may try making these ring sleeves from scratch and give each sleeve a unique design and feature! You can also try making wooden beads for your dreadlocks. For this you may buy a few small cubes of wood and some circular ones. These cubes must be big enough to fit your hair, once they are made into beads. Measure the diameter of your hair and accordingly make a circular mark, which is half an inch bigger, on the wood. Now you may chisel the edges off and smoothen the sides using sandpaper. This will take some time before an actual oval-shaped bead is formed. In case you wish to make a cubical shaped bead, simply cut the edges off using a pocket-knife, while ensuring that the cubical shape is still retained. Now drill a hole into the demarcated area, using a drilling pin which matches the marking. Be very gently, as excess force may break the bead in two, or cause a big ugly crack to form! Making the hole manually will take too much of your time and will not be perfect. Now you could make designs on the cube using a fine thin tipped chisel, or you could paint on it! These beads and sleeves, can be made using a wide range of fabric. However the easiest fiber to use and manipulate with is cotton fiber, which can be wrapped over a blob of cotton wool, and stitched using colorful thread. 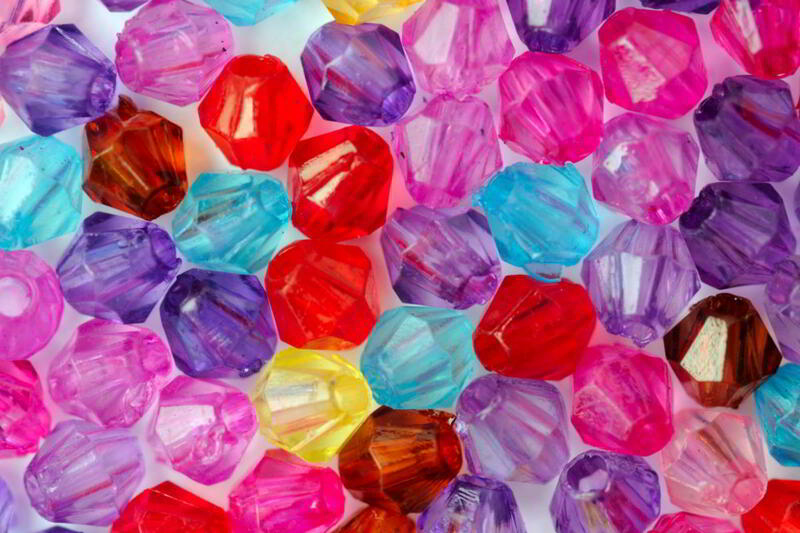 It depends on you, whether you wish to make a round bead or a rectangular sleeve shaped bead. Nonetheless, once you have the basic shape stitched to perfection, you will need to poke a hole through the bead, in order to accommodate a dreadlock to pass through it. Stitch the borders around the hole, to secure the bead from tearing, and looking untidy. Now, you may stick tiny glass beads, and sequences, all over the cloth bead, or sew designs on the bead. 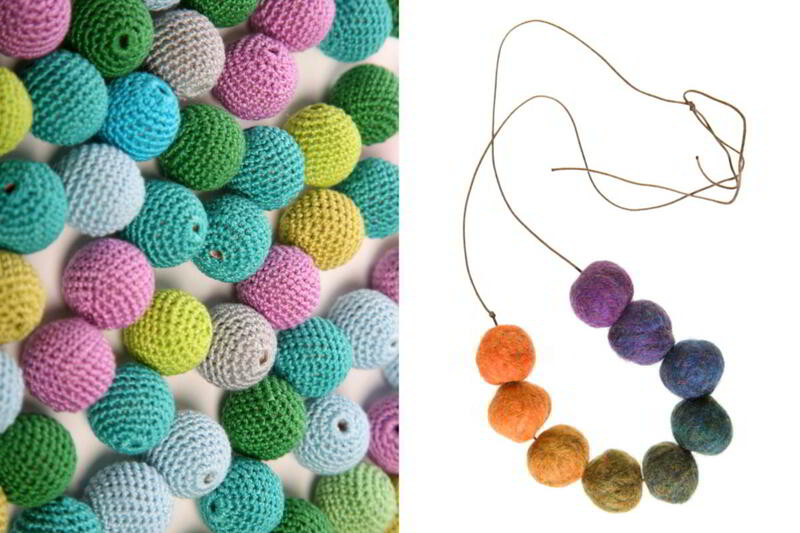 You may also try painting the bead with fabric colors! You may make thick and colorful paper beads using attractive magazine scraps. All you need to do, is to cut a few pieces of magazine into big triangles. Make a collection of all the colors you require for your dreadlocks. After which you must tightly wind each triangular piece of paper to a fat pen or stick. When you make the first coil, stick the paper to the inner surface of the sheet using glue. Do not let the paper get stuck to the pen, which is why you must keep rotating the pen. Make sure you wind it in such a way that, it remains loose enough for the pen to be removed. Now stick the ends of the paper and let it dry, after which, you may slide the pen out. You can also make round paper beads by simply winding triangular paper sheets over and over again on the same spot of the pen. And keep sticking the sheet onto the new triangular piece of paper, every time you wind. Apart from paper; plastic, and scrap metal, can be used with ease to create ring shaped dreadlock sleeves. These can be made using a wide assortment of products, such as bottle lids, metal cans, baby bangles, and hoop earrings. You can make dreadlock beads using attractive florist / artist wire, and simply wind them into spring shaped sleeves. Wind the wire over a fat pen in order to make the spring shaped wire sleeve, thereafter, use a cutting plier for making tribal swirls with the wire at each end of the sleeve. For making swirls, you will need to do bend the wire inwards, or you could make rather eccentric designs such as swans and snakes. If you prefer, you may add small glass beads through the metal wire, and make it a part of the dreadlock sleeve itself. Explore your options wisely, as you can make so many thrilling designs using just plain wire! You may also, try using a bunch of colorful plastic wires, which can be bend to form a screw shaped sleeve for your dreadlocks! Hopefully, now your knowledge of making dreadlock beads has increased substantially. 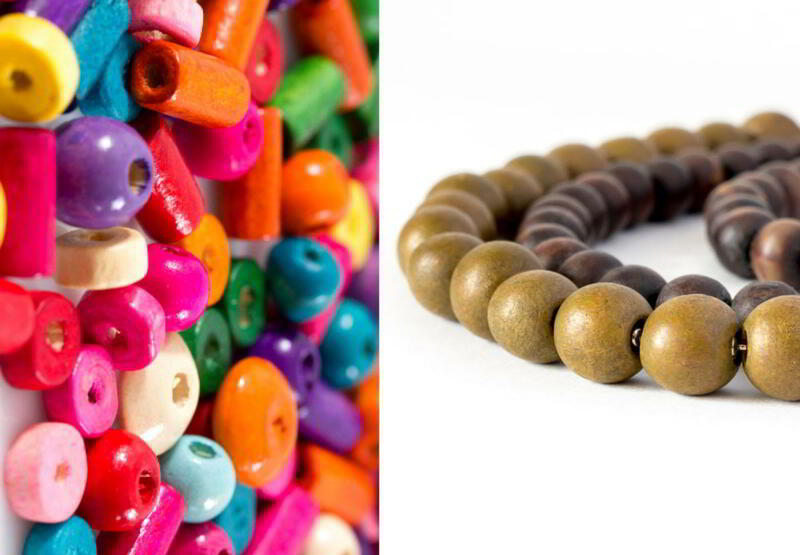 With practice, you will begin to come up with your own ideas of making the beads look more attractive and long-lasting.